Mason residents now have a whole new activity for "game night". In honor of Mason's bicentennial, the city has produced a unique custom-made MONOPOLY game to celebrate its 200th birthday. The Hasbro-produced game features local businesses and civic organizations throughout the board's properties and its many game features. 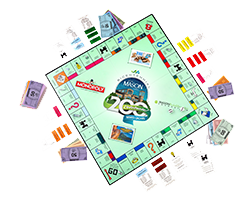 Only 3,000 Mason MONOPOLY games are available for purchase so act now. There is FREE Delivery to any Mason area address! The game is a huge hit for graduation and corporate gifts. Games retail for $30 each. All profits are earmarked for the building of the Mason Parks & Recreation Foundation's new Common Ground Playground. Games can also be purchased anytime at Yost Pharmacy and the Symbiosis store located in the Mason Community Center. Order now by clicking the ORDER YOUR GAME button to the right to get this unique gift! Please contact Rachel for more information.